Let’s ask… what’s the point of the ERP system? There are often grouses about the Electronic Road Pricing Scheme, in short – ERP. The ERP replaces the Area Licensing Scheme. Back in those days you need to buy stickers. No sticker and the police would be taking down your license plate for a fine. The question is not whether ERP totally stops congestion, that would be a tall order. No system in world can solve that. The proper question we should be asking is “Whether ERP would ease congestion“. Better still, you could also ask “Would it be worse, the same or better with ERP“? ERP uses price as a system on influence over your decision to use a piece of road. Users that wake up earlier are rewarded by cheaper road usage. Users that prefer to sleep in have to pay more. If you plan your road well, there are also options to drive cheaper roads. For example: from the hours of 0830-0900, a trip from Bedok to Shenton Way costs $4.50 if you use the ECP continuously. However if you use the alternative route of Nicoll Highway, it costs only $2. Without this system of influence, everyone would just use the road as they damn please. This influence is measured and quarterly reviews of the road raises or decreases the ERP rates accordingly. 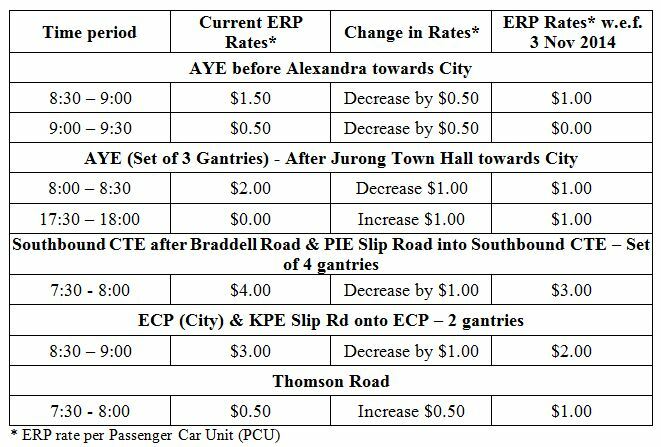 The data shows during school holidays road usage is not high, thus ERP rates are lowered then. 1. Students. These students have a low allowance even though their parents had bought them a car or lent them the family car. Many of them scrimp and save on parking and ERP. Many of them, because of ERP, go to school early, or later. Some of them even stay back in school to study until the evening ERP time is switched off. 4. Those that want to save. Many of them have took up the park-and-ride scheme, which is quite successful. Many of the park-and-ride carparks are fully or almost fully occupied.